Much as I have been missing "real" dessert, I've been missing breakfast. It's late September and my favorite fruit season is over so it's back to bananas for breakfast. Sigh. Sometimes I wish we lived somewhere that I could walk across the street and have a yummy breakfast treat, lovely cup of hot tea, and people watch. Like we did when we were on vacation in Monterey. 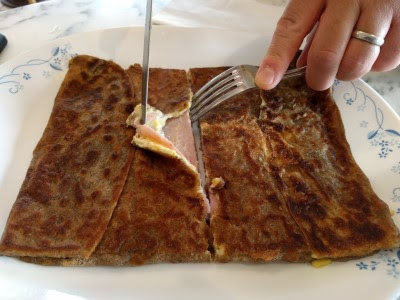 When we exited the lobby of our hotel, there was a cute crepe cafe right in front of us and that's where we went for breakfast nearly every morning: Crepes of Brittany. 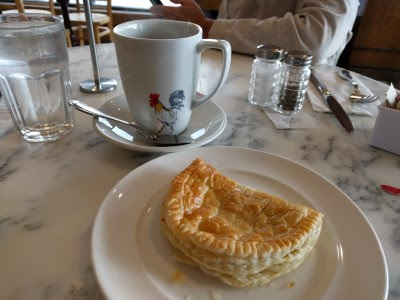 I almost always had the apple tart pastry (if those were gone, I'd have a croissant) and then helped SP eat his breakfast crepe, usually ham or turkey with egg & cheese. 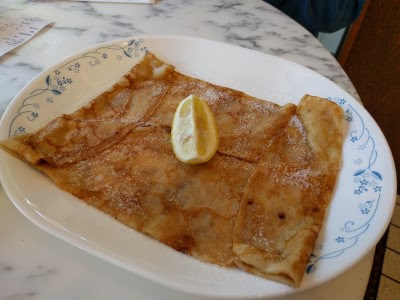 A couple of days, we stopped in late afternoon for a crepe snack like the lemon & sugar one in the above photo. We shared the sweet crepe and got a large cup of tea to go then wandered along the wharf, sipping our shared tea. It was so nice. Though we weren't super impressed with our hotel, I'd stay there again because of its location to this crepe place & Alvarado Street with its shops & restaurants.